Note: The section Admin(istration) home is called Control Panels since Tiki 14. 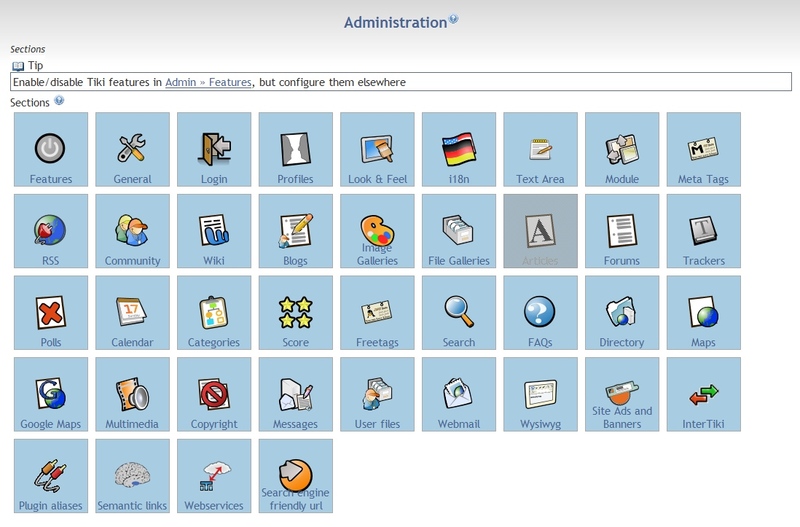 From the default Tiki menu, select Admin > Admin Home. Basic features are probably needed for most Tiki sites. Advanced features may be for more specific use cases or require more expertise. Experimental features include recently introduced features that may not be complete or bug-free, and also features that may be redundant or retired soon. Unavailable features are those that aren't functional due to the server configuration, etc. of the particular Tiki installation. Use the Configuration Search to quickly find any of Tiki's more than 1,000 configuration options. The most common features can be accessed by clicking the appropriate icon. Inactive features are ghosted, or grayed out. Go to the Features page (tiki-admin.php?page=features) to activate them. Some features cannot be accessed by a specific icon/button. Instead, use the Crosslinks area at the bottom of the page. The most common features can be accessed by clicking the appropriate icon. Inactive features are "grayed" out (such as the Freetags button, in the following image). This is the main page for configuring your Tiki, which is reached at your URL/tiki-admin.php. The most commonly used features are represented by icons on this page. If the feature is inactive, the background is grey. The screenshot below shows a TikiWiki version 3.0 panel with the Articles feature deactivated and all the rest activated. Clicking on the Features icon will take you to the Features Admin page, where you can activate or deactivate any of Tiki's features, including features that are not shown on the main page. Clicking on the other icons will take you to the configuration page for that feature or utility. Tip: You can use the Quick Admin links at the top of the page to immediately access the most common Administration pages.